At once perfectly simple and ingeniously imaginative, The Book With No Pictures inspires laughter every time it is opened, creating a warm and joyous experience to share—and introducing young children to the powerful idea that the written word can be an unending source of mischief and delight. B.J. Novak is well known for his work on NBC’s Emmy Award-winning comedy series The Office as an actor, writer, director, and executive producer. He is also acclaimed for his standup comedy, his performances in motion pictures, and his New York Times bestselling book of short stories, One More Thing. BJ wants to see YOU read The Book With No Pictures aloud! Check out our video contest and see how YOU read the book! No two readings are the same. 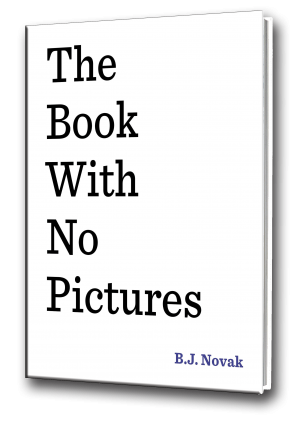 Children’s Book World is hosting a book signing with B.J. Novak, Drew Daywalt, and Pharrell Williams!